This extension enables you to quickly import your Apache web logs into Strata. This tool imports and appends multiple, raw Apache web logs into a single table and parses the data into the appropriate columns. It works with both the Apache common and combined log formats. Web logs contain all kinds of interesting data. There are many types of web log analytics tools out there, such as Google Analytics and AWstats; this extension helps to supplement them. For instance, sometimes it is really useful to get your hands on the raw web log data in order to pick out individual trends, identify website errors, track robots or do other ad hoc analysis that standard web log tools may not perform out-of-the-box. The problem with web logs is that it takes a bit of work to convert the raw tab delimited logs into a nice, usable format. This extension does the appending, parsing, importing and data transformation in one go. 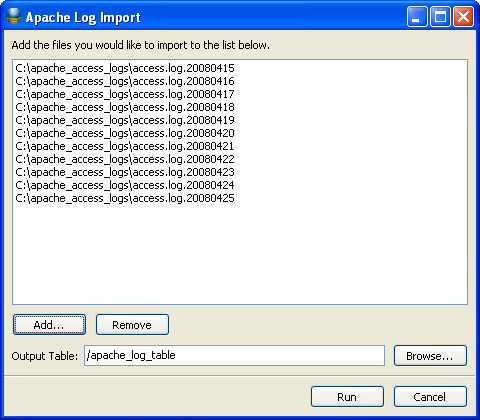 After installing the extension, select “Import Apache Logs” from the Tools menu and an import dialog will appear. Click the Add button to browse your system for the web logs you wish to import. If you select the wrong file, select the file and click the Remove button. Select a name for the output table; you may select a folder in your project by clicking the Browse button. Click the Run button to being the import. You can see the progress of the import by viewing the status bar on the bottom right of Strata. Or, you can select Jobs from the Tools menu. Once the import is completed, the table will appear. Click the “X” on the top right of the Apache Log Import extension to close it and begin working with your log files. Further details about this video can be found at this Strata Blog post.